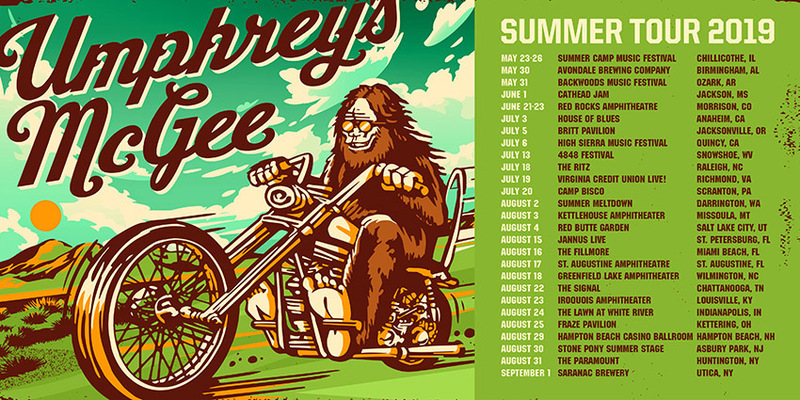 Umphrey’s McGee is cruising the country this summer with a monster tour traversing the US of A. With festival appearances, stand-alone shows, and phenomenal support acts lined up along the way, there’s likely an UM sighting in your neck of the woods. After headlining summer’s official kick-off party, Summer Camp Music Festival, we hit the road in Birmingham, Alabama to kick off summer tour. Spafford, Turkuaz, and Jason Bonham round out what is sure to be a barn-burner at Red Rocks, before Hawaii’s own Ron Artis II & The Truth brings their deep soul sound to Anaheim, California, and Jacksonville, Oregon. Southeast super-sextet, Big Something, is back for a smattering of dates, the formidable Pigeons Playing Ping Pong bring the heat to Big Sky Country this August, and Miami’s indie-funk trio, Magic City Hippies, sweeten the ticket in Florida. There are still a couple of dates that we have yet to announce (logistics, shmogistics) so stay tuned for some heavy-hitting stragglers in the coming weeks. Pre-sale tickets for most shows will be available tomorrow, Wednesday, March 20th at 11:00 am ET and general on sale for all shows begins Friday, March 22nd at 11:00 am ET. Visit umphreys.com/tour for additional ticket info and more. It’s no hoax, y’all. Summer Tour 2019 is on like . . . well, you get the point.